Tactical Tea Supplier & Wholesaler Online | Best English Tea Bags for Veterans in UK What On Earth Is Tactical Tea? What On Earth Is Tactical Tea? ‘Each Tactical Tea tea-bag is delicately hand-stitched by a cohort of carefully trained, and not to mention deadly, magical Wood Elves. They dedicate their lives to make sure your tea tastes as ally as possible. When they’re not lovingly crafting each bag of tea, they’re in the woods, practicing their high speed-low drag weapon drills.‘ Straight from the Tactical Tea website. Tactical Tea is a tea company ran by two serving soldiers, Alex and Ted. They don’t do things normally, the above quote is taken from the product description of their first product, WW2 Brew, and demonstrates their passion and commitment to a tea that stands out from the humdrum blends of other, larger, very unnamed, companies. A mix of tongue-in-cheek tag-lines, old school WW2 style branding, and a serious commitment for a good brew, sets Tactical Tea apart as a serious contender to sit on your kitchen top. They started trading in late October 2017, with over 5600 Instagram followers (to date, find it here), 3500 Facebook followers (also find it here), and over 20 five star reviews, Tactical Tea has taken the tea community by storm. The first blend, their WW2 Brew, is a no-nonsense English Breakfast blend. 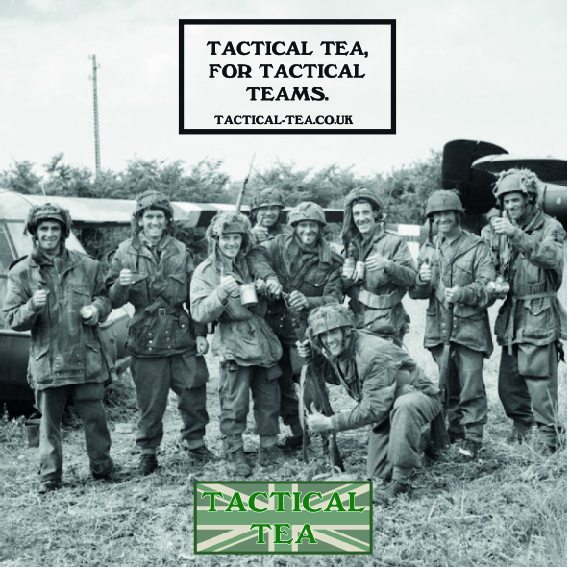 And the tagline ‘Tactical Tea, for Tactical Teams’ is designed with the end user in mind, down-to-earth squaddies, veterans, and the wider military community/supporters. The pair have also teamed up with the Facebook group ‘Warriors RV’, in order to serve the NATO BREW to the warriors of the group. 10% of profits from the NATO BREW are donated to the great fundraising cause that is ‘Team Breya’, ‘ Breya Is 2 years old and the daughter of Ollie Ward (of The Parachute Regiment) and Holly Robinson was sadly diagnosed with Stage 4 High Risk Neuroblastoma. A very rare Cancer that effects Children under the age of 6.’ The GoFundMe campaign has raised over £120,000 and is almost halfway to its goal of £250,000 which will be used to undertake trial therapies in the US. Tactical Tea will continue to donate some of its profits to Team Breya, until the goal is reached. The WW2 Brew is described as ‘A simple, refreshing, English Breakfast blend, lovingly packed into square cloth bags, carefully sourced from Kenya, East Africa, and Assam (that's why it's stronger!). Not to mention, tactical AF.’ Operating from Newcastle Upon Tyne, Alex and Ted have solid plans for what Tactical Tea will become, an awesome company, for awesome people. Contact – Tacticaltea@my.com for collaborations, wholesale and enquiries!